Microsoft teases May 2 '#MicrosoftEDU' event – is it Windows 10 Cloud? 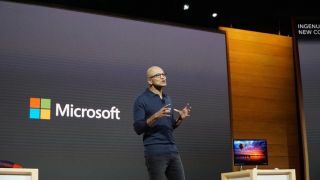 May is set to be a major month for Microsoft, as the firm has just teased a media event in New York City for May 2 titled simply "#MicrosoftEDU". The invite came to us at TechRadar with an adorably drawn image of a city skyline coated in a white sky with text that reads "Learn what's next." But wait, that's no sky. If you look closely at the image below, you'll notice a sliver of blue peeking from the right side, implying that the white space is actually cloud cover. That's clever, considering ZDNet's April 11 report that Microsoft would be holding an early May event, codenamed "Bespin" (get it? ), likely to debut Windows 10 Cloud. With a hashtag like "#MicrosoftEDU", the company's intentions are obvious at least at a broad level. However, what's less obvious is Microsoft's strategy around this would-be Windows 10 Cloud. What will Windows 10 Cloud offer that Chrome OS can't, as Chromebooks slowly begin to dominate the education scene? And, what will the hardware running this new version of Windows 10 look like? Hopefully, we'll find that out on May 2. The event begins at 9:30am ET (6:30am PT; 2:30pm GMT; 11:30pm AEST), so come back then to learn the latest from TechRadar.